Hey guys! A couple of weeks ago my boyfriend and I went for a lovely long weekend in Geneva, Switzerland. 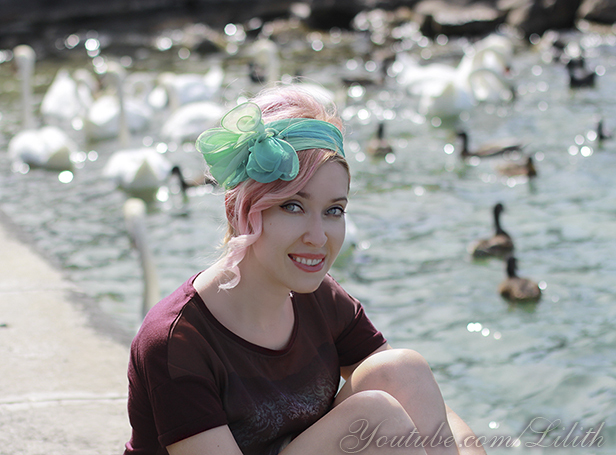 In this post I'll share with you all the highlights of my stay and hairstyles I was wearing. Most of them were super quick and easy to do, so hopefully they'll get your inspired to be even more creative with your hair. A morning train from Paris got us to Geneva in around 3 hours. The weather was wonderful, so we went exploring the city. It was a really hot day and I needed something to keep my hair away from my face and neck, so I decided to go for a super quick updo that you can see on the photo below. It's a real life saver when you're running out of time (or just being lazy) but still want to look like I've made an effort :) You can watch the tutorial here. In the video I've pre-curled my hair to get a more fancy look, while here I just used my natural straight hair. Here is another photo. Can you see that little dragon on the left? On the second day I decided to do something fun with my hair. There was only one problem: my dark roots have grown really long and I didn't touch them up before leaving. I hate hate hate photos with visible roots so I started to think what could I do about them. I remembered that one hairstyle of Rihanna with a bow headband and decided to give it a try. 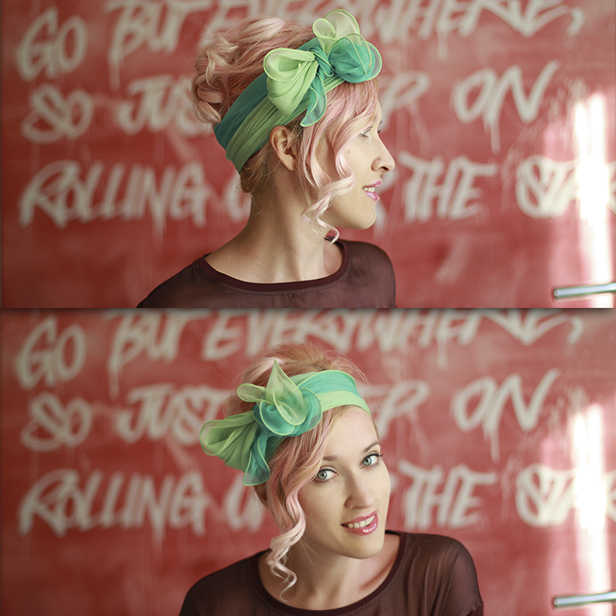 Strategically placed scarf has covered my roots really well ;) I firstly curled my hair with a flat iron and then pinned it into an updo just like I've shown in this video (I skipped the braid part). 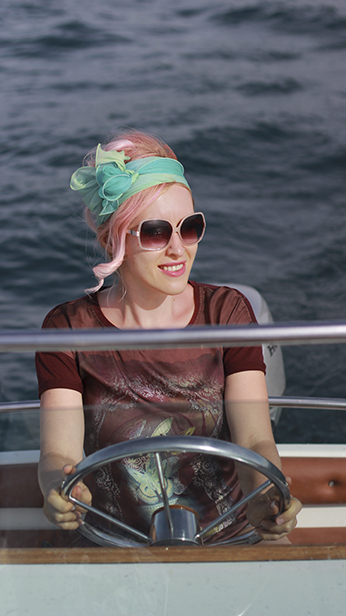 You can also check out my video on 10 ways to tie a head scarf. 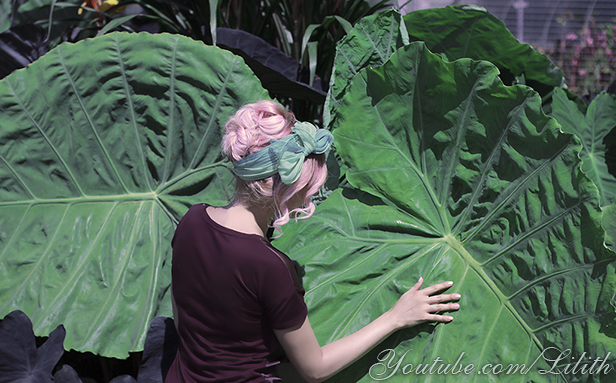 We went for a walk to one of my very favorite places in any city - a botanic garden. The place was really beautiful, and here is another one by a lovely pond with water lilies. Here you can see my hairstyle even better. 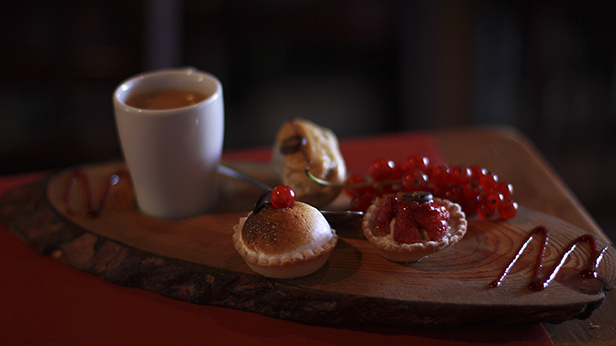 We had a quick lunch with the most beautifully served "cafe gourmand" I ever had. Yumm! 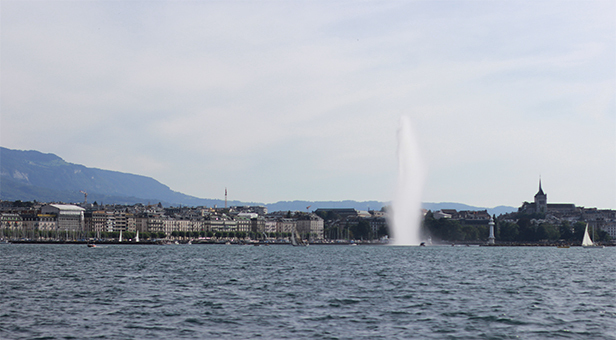 Geneva stands on the border of a wonderful lake with a magnificent jet of water (Jet d'Eau) being its main attraction. 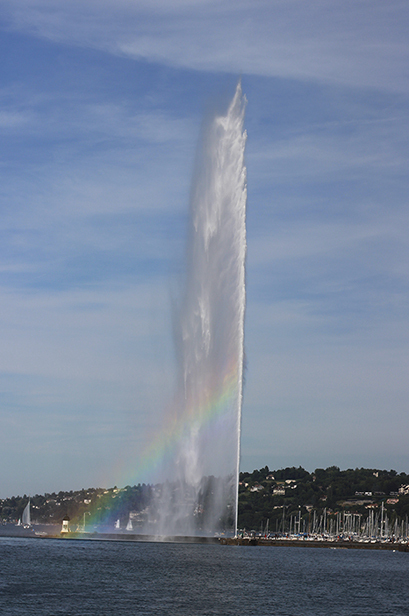 We went for a long walk by the lake and I still can't believe that I saw a real rainbow right in the fountain!!! It really felt like seeing a miracle! And it's amazing how my camera actually captured the entire thing really well :) How magical is that?! We hired a boat and went for a ride to see Geneva from another angle. 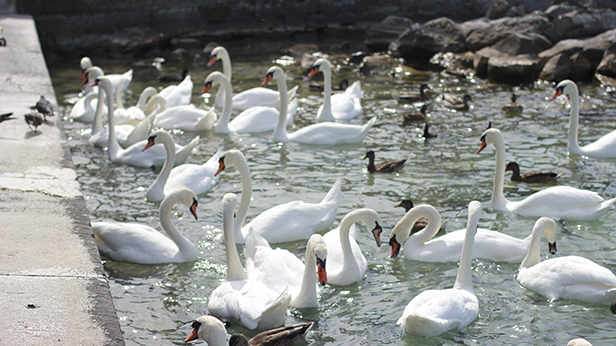 Another thing that got me really impressed is the amount of swans in the lake. There are hundreds of them and they are literally everywhere. Along with all kinds of ducks I never saw before :) You look at them and suddenly feel like you're in heaven! For our dinner, I decided to change for something more elegant. My hair was already curly, so I just pinned it into a side bun using the technique I've shown in this tutorial. 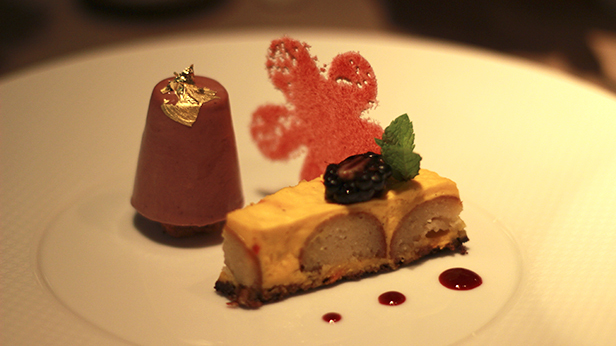 Our dessert was another masterpiece that I had to capture for the record. 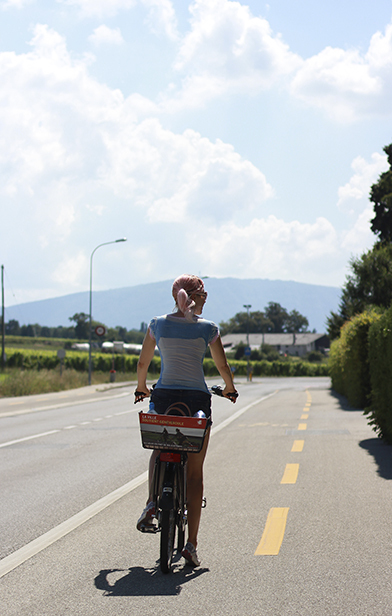 I have to tell you that Geneva is just CRAZY expensive, *but* they give you free bicycles to cycle for 4 hours. How surprising is that! So we decided to go for a ride outside of Geneva along the lake. I was in the mood for something playful, so I went for a side swept ponytail with a cute dutch braid in front. 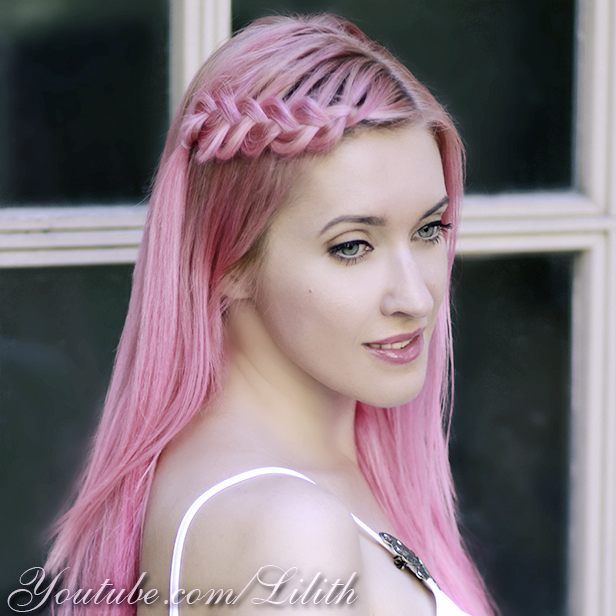 You can check out this video to learn how to create such a braid. I wish I could cycle to countryside more often, it's so peaceful and relaxing! 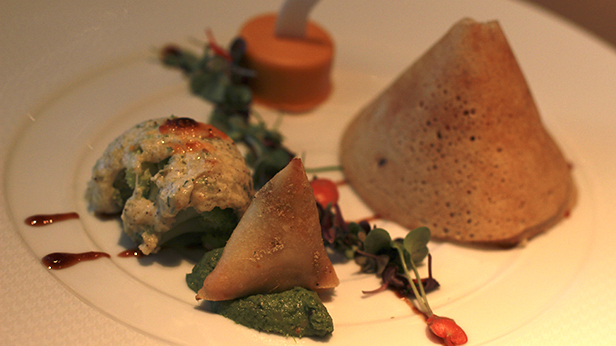 In the evening, exhausted but happy, we had a dinner in an Indian gastronomic restaurant. 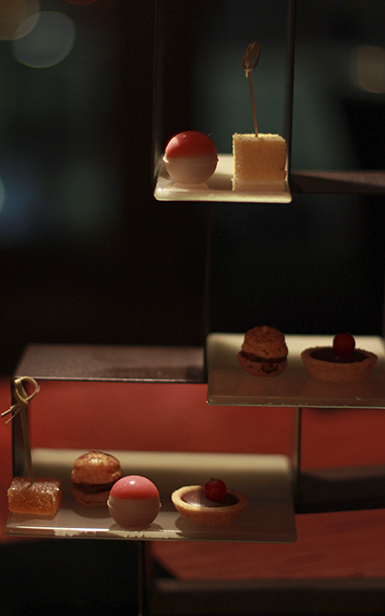 Interior decor of the place and the art of serving food was beyond gorgeous. That evening I was just too tired to even think about what to do with my hair, so I just washed it and pinned the front section off my face to get that elegant effortless look. Do you see this pink bobby pin? I was sooo happy when I found them :) I really hate using bobby pins in colors that do not match my hair lol so these ones were a real find! That was the last day of our stay in Geneva and the next morning we returned back to Paris. I'm already looking forward to the next summer so that I could start planning my following vacation! And how about you, guys? What places would you like to visit? Hey guys! 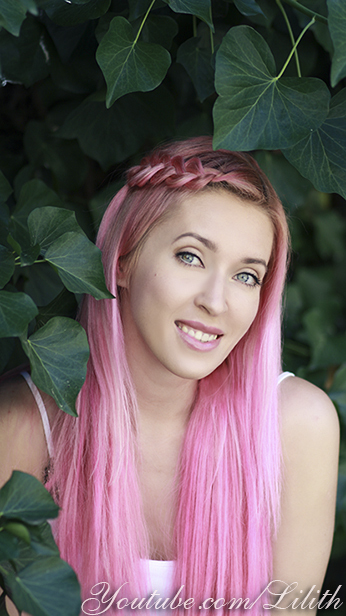 This post is for those of your who were asking me how I colored my hair pink. 1. I love my blonde hair, but I had it for too long and need a change. 2. 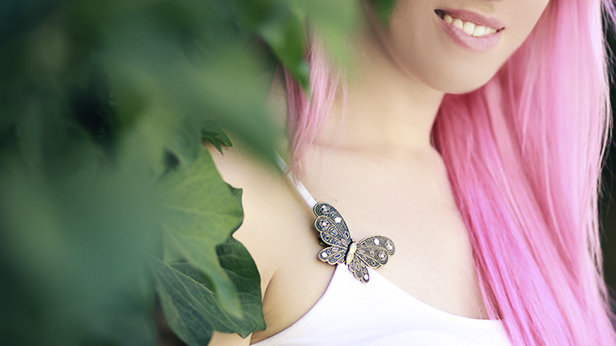 I love pink hair :) To each its own, you know! So far I tried 2 different products. They are both ammonia-free toners that do not damage your hair. BUT they work only on blonde hair - either natural, colored, or bleached. 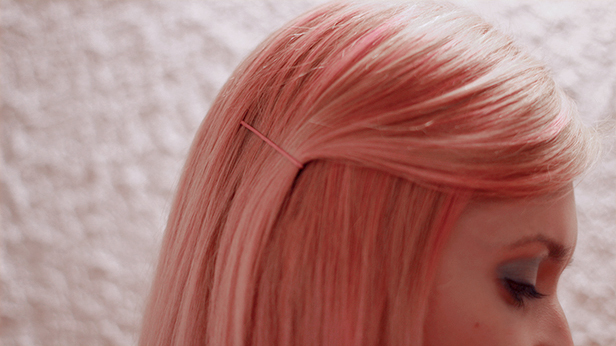 The lighter your hair is, the more vibrant pink you're going to obtain. In photos in this post I have my entire hair colored pink, while in my earlier post you can see photos of pink highlights that I had before. 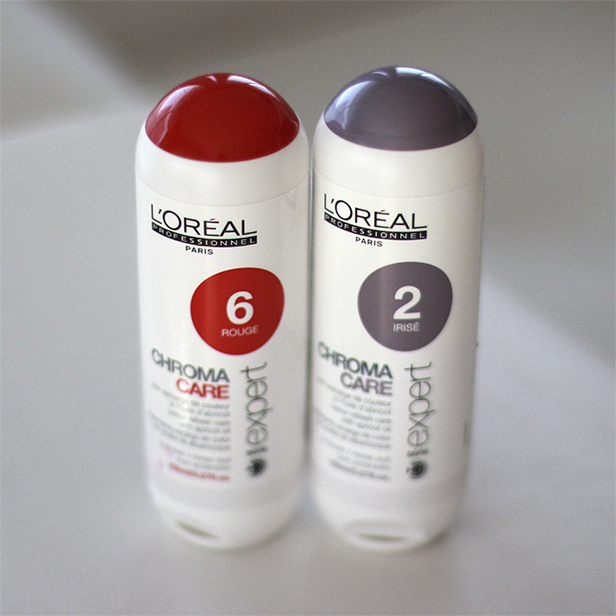 The first time it was just a strand test with L'Oreal Chroma Care toning conditioners. I applied it onto the bottom layers of my hair to get an ombre effect with pink ends. #6 is a red-pigmented toner, while #2 is a light purple one. #6 is usually used to revive red color, while #2 eliminated brassy pigments from light blondes. 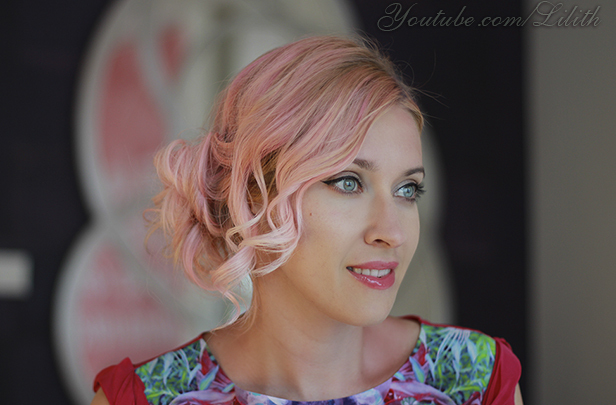 To achieve a beautiful pastel pink, I added just a couple of red drops into the purple toner. I applied the mixture onto my shampooed and towel dried hair and rinsed it after ~30 minutes. The color I obtained was a super pretty baby pink, a very very light one. If you'd like to get a vibrant pink, I don't think these toners would do the job. Because if you'd add more red, the mixture would turn red rather than pink. The color itself didn't last long at all - it was totally gone after I washed my hair twice. So taking into account the high price of these products, I wasn't really happy about it. But for some of you who'd like to change their hair color only for a couple of days, these toners could be a perfect solution. Though I don't think they'd work on darker blonde hair. Since they produce a really light pastel color, your hair should be a very light or platinum blonde (level 10 or 9). These toners are at once conditioners, so they have nothing but a good effect on your hair. 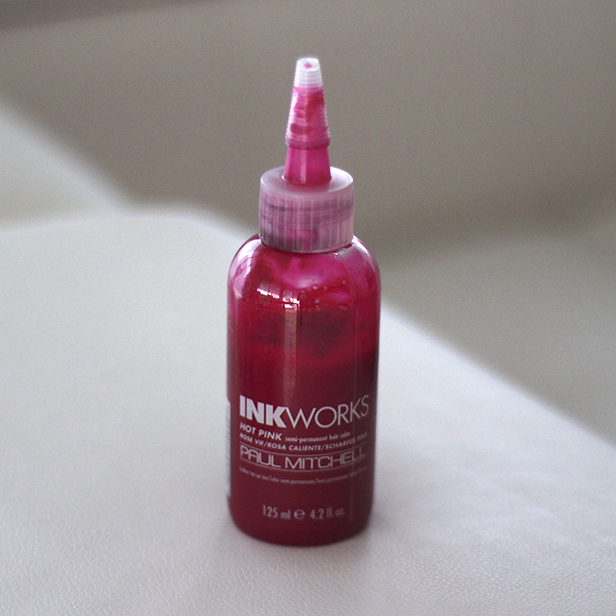 The second toner I tried was Ink Works from Paul Mitchell. I found it when I was looking for a professional products for hair lamination. I bought both transparent and pink toners, and they met all my expectations. So here is how I use it. I grab any hair conditioner and add several drops of Hot Pink into it. On the photo above you can see that the color of the toner isn't exactly pink, but mixed with a white conditioner, it creates a pink mixture. So I keep on adding this toner drop by drop and mixing it with the conditioner until the color of the mixture corresponds to the color I want to have on my hair. So far I was applying it onto my dry hair and leaving it on for ~30 minutes. I already used this toner to color my own hair 3 times (firstly just highlights, then my entire head) as well as to color a set of my hair extensions (which is really A LOT of hair), and you can tell that the bottle is not even half empty yet!! So this product is really cost-effective and I can really recommend it. If you're wondering how I've colored my clip-in hair extensions (my own hair is shoulder length, so in all of my long hair tutorials I'm using the extensions for that extra length and volume), I did it just like I've shown in one of my previous tutorials linked below. This time I only used Ink Works instead of Wella products. It's written on the bottle that the toner is supposed to lasts ~20 washes and I think it's true. The color is washing off really gradually though, it's hard to tell the difference after a single wash. But over time it does fade, and it fades really beautifully. That's another thing that I loved about it. 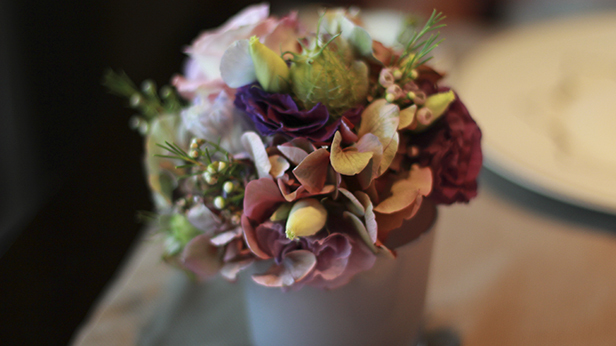 I started with a kind of a vibrant electric pink which gradually washed out though gorgeous pastel shades of baby pink. So if you love pink, you'll totally enjoy the entire experience! I think after 10 washes the color becomes really light, but is still takes another 10 washes till it is gone completely. And of course, you can re-tone you hair any time you feel like. Another great thing about Ink Works is that I just loved the condition of my hair after using it. It felt healthier and thicker, much more shiny than when it's blonde. Here are a couple of photos of the entire outfit I was wearing the other day. I love to pair my pink hair with boho chic clothes and this maxi skirt is one of my favorites. The braid I'm wearing here is from this hair tutorial.